The “Blog” of “Unnecessary” Quotation Marks: "get fresh"
Another one from the minnesota state fair (like I said, I'm over two months behind) from Anna this time. She likes the implication that you should freshen up. Like it's a slogan. Truth be told, cheese on a stick is fun, but it won't make me feel fresher, that's for sure. I have a serious hankering for some cheese on a stick now - thanks. Anyone know where to find cheese on stick in North Texas?!? Are you sure that sign's not an invitation to get a little handsy? 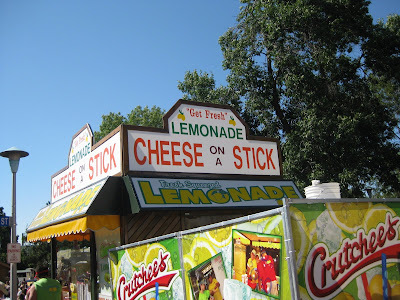 I just laughed when I saw cheese on a stick. Or is it "Cheese on a Stick"?